I highly recommend this product and the services provided by Kats 'n Us. I needed a kennel to ship 2 puppies that I was buying from TX to me in FL. They are Great Pyraneese puppies and at only 8 weeks old they were already 2 feet long and weighed between 18-20 pounds each. 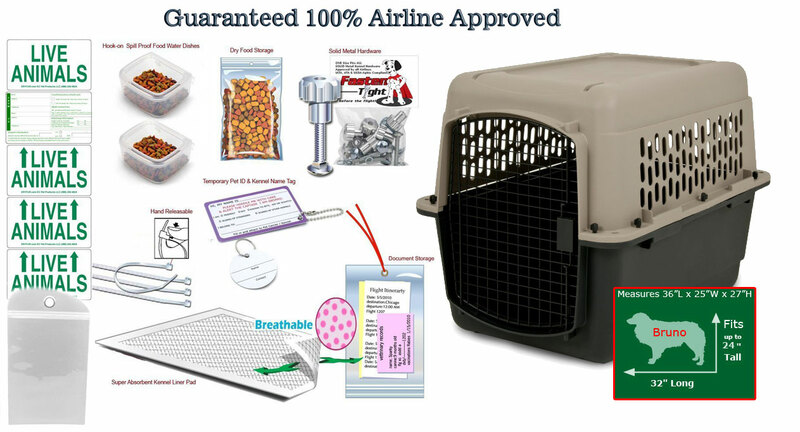 Because of this I was very nervous that I would end up buying a kennel that was too small & the airlines wouldn't take it. So I bought this one after careful measuring of the puppies & the help I rec'vd on the phone at Kats 'n Us! Very nice, friendly, & helpful! This kennel is not only big enough, there's extra room, and it's very sturdy! Best part is that it comes with all the airline requirements & I had no trouble at all! Excellent product & company to work with. My puppies arrived safely & I'm very happy to have this kennel for any future needs. We used this crate for our 20lbs cat travelling from the USA to UK via airplane. He was very secure and comfortable for the duration of the trip and I would recommend this crate for heavy travel. Very pleased with this product.